I’ve become slightly obsessed with the modern farmhouse plans that Southern Living sells. Remember when I tracked down a handful of houses built around the country with the same popular Sugarberry Cottage floor plan? I just heard about another version of the house built in Prospect, Kentucky. Take a look! This one has the same modern farmhouse look as others that used the popular floor plan, but they customized it with some changes here and there. It’s fun to see how everyone designs their Sugarberry Cottages to look a little different. I read that this one is a little bigger than most, too. I haven’t seen two fireplace walls done the same way yet. This one has red brick up to the ceiling with windows and built-in bookshelves on either side instead of the glass doors leading to the porch the others had. The living room is open to the kitchen and dining areas. The kitchen looks a little more open than some of the others we’ve seen. The home has 2,300+ sq ft. There are 1,525 sq ft on the first floor + 842 sq ft on the 2nd , with an additional 1,500 in the unfinished basement. Instead of a screened porch on the side as most Sugarberry Cottages have, this one was left open, but the homeowners plan to finish it someday. It offers an additional 200 sq ft of outdoor living space. Because the lots are small in this neighborhood, the homeowners paid extra for a corner lot they could fence in for their Shih Tzus Rambo and Roslyn. There are also three dogs parks within the neighborhood where they can play and meet other dogs. The house was built in the Norton Commons neighborhood in Prospect, Kentucky, which has a lot of charming new houses being built in traditional styles like this one. For more photos and information, check Meridian Construction and take the video tour. Delightful! Notice the detail at the top of the front gable — I think that’s a version of a dovecote, which I thought about adding to our house. Usually, dovecotes have holes, for the doves, of course. Anyway, when I win the lottery, I shall build a trad neighborhood like this one. 😉 Wish me luck! It’s really pretty and a very livable home and community. Kudos to the design team. Ha, so true. All the houses in my neighborhood have that setup, too, so you really have to figure out some kind of window coverings to keep from flashing the neighbors! They do have plantation shutters for privacy here, though. When I built my house, I put the tub under the window because I like to crack the window open and have fresh air coming in while I bathe, otherwise I get too hot. I like hot water, but cold air! Go figure. I simply put curtains half way up the window, and I have all the privacy I need from my neighbors. I love the Sugarberry house plans except for the open concept kitchen. I have a feeling some years from now, that this trend will not be popular due to everyone being tired of trying to keep their kitchen spotless and then, let the walls go back up! Love that look. My dream is to have a screened in porch so that is the only thing I would change. I find the complete lack of yard/personal space bizarre. 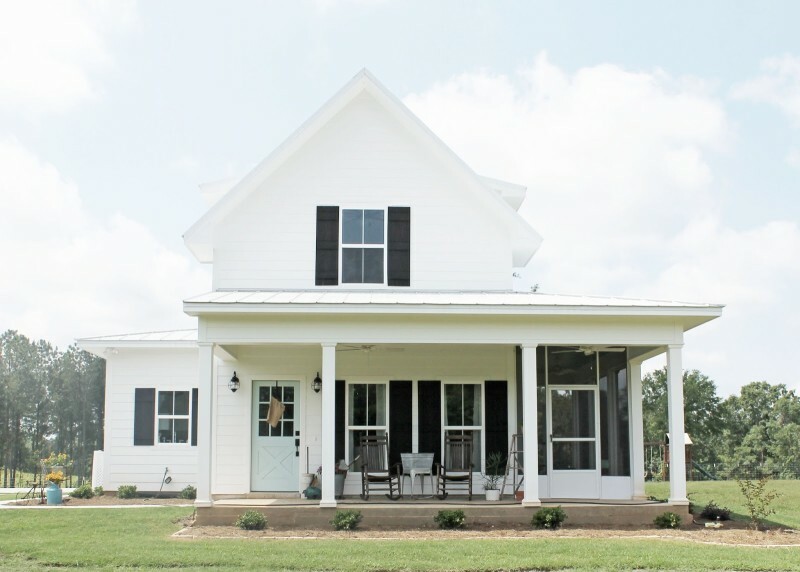 It looks ridiculously smooshed, especially for a “farmhouse” in Kentucky. Move it over to the empty field behind them. That field wasn’t empty for long. A school and other homes have since been built there. Love the house ..don’t like the open plan kitchen sitting room ..rather have them separated with a wall ! Such a lovely house! Love the master bedroom! I love this home design. The extra open kitchen and brick walled fireplace are awesome. I do agree with Reba though….I think this style of home would be better suited to a big country lot, as opposed to a subdivision. What a great floor plan…I am searching for the perfect plan for my downsized home….getting to the point where we may have to have some plans drawn up….I want a room where I can do my laundry, craft, a great potting area….the all purpose room…(I don’t want much!)….. Not really a fan of how they designed this one. I can’t believe they got rid of the screened porch in Kentucky! All the missed evenings due to mosquitoes. And the varying heights of the cabinets in the kitchen are a bit ridiculous and the swooshes on the glass-front parts a bit much. I do really like how they lengthened the house, adding an extra door to the side porch in addition to the windows. And I do love seeing all of these Southern Living houseplans in the flesh! Keep ’em coming! The builder wasn’t able to finish it in time, but they plan to screen in the porch eventually. Nice colors! Did the source provide paint colors, or do you know who I could ask? We’re building a house now and the whole color-choice thing is driving me crazy!! I’m afraid I don’t know the paint colors, but maybe you could find something similar? Do you know who built this home? I’d be interested in seeing the floor plan. I love this house, but would want it be around the 1800 sq. ft. range for a family of 4. There’s a link to the builder’s site at the end of the post if you’d like more information about it! Love this! I would love to see a plan with the modifications they made- I can’t seem to find anything other than the originals. I love this house design. It’s perfect for an empty nester who lives by the beach. Hope to build this design, and if I do, I will keep you posted of the progress. I love the house and I am seriously considering building this home but I live in Maine and will use the fireplace from Oct. till May and I hate having the television above the fire, its distracting. I am going to look into placing a wood stove over by the stairs but it kind of displaces kitchen table. Any other ideas? Thanks for the pictures. I have always loved the look of the exterior of this house. It is so nice to see the inside and put it all together.